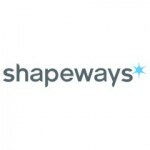 Shapeways is the leading 3D printing marketplace and community, empowering designers to bring amazing products to life. By giving anyone the ability to quickly and affordably turn ideas from digital designs into real products, Shapeways is fundamentally changing how products are made and by whom. Through Shapeways, designers gain access to the best industrial 3D printing technology, capable of manufacturing products with complex designs in a wide range of high-quality materials. 3D printing turns raw materials into original products, from wedding rings to rocketships, model trains to iPhone cases, and prototypes to industrial engineering parts. The Shapeways community can sell their products, share ideas, and get feedback from creative consumers and other designers around the world. Headquartered in New York, Shapeways has factories and offices in Eindhoven, Queens, and Seattle. Shapeways is a spin-out of the lifestyle incubator of Royal Philips Electronics, and our investors include Union Square Ventures, Index Ventures, Lux Capital, and Andreessen Horowitz.